Location of Addis in West Baton Rouge Parish, Louisiana. Addis is a town in West Baton Rouge Parish, Louisiana, United States. The population was 3,593 at the 2010 census. 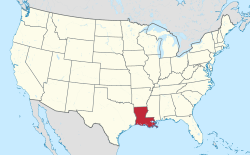 It is part of the Baton Rouge Metropolitan Statistical Area. Founded in 1881 or 1882, Addis was originally known Baton Rouge Junction; the community was created as a division point for the Texas and Pacific Railroad. Circa 1909, local citizens renamed the village to Addis to honor J. W. Addis, the railroad official who had convinced the railroad to build a depot, hotel, and other facilities there in 1904. The Bank of Addis building, listed on the National Register of Historic Places, is located in the town and is now the Addis Museum. Addis is located at 30°21′17″N 91°15′53″W﻿ / ﻿30.35472°N 91.26472°W﻿ / 30.35472; -91.26472 (30.354585, -91.264672). As of the census of 2000, there were 2,238 people, 803 households, and 598 families residing in the town. The population density was 1,230.5 people per square mile (474.8/km²). There were 864 housing units at an average density of 475.0 per square mile (183.3/km²). The racial makeup of the town was 76.14% White, 22.97% African American, 0.22% Native American, 0.13% Asian, 0.04% from other races, and 0.49% from two or more races. Hispanic or Latino of any race were 0.98% of the population. There were 803 households out of which 40.6% had children under the age of 18 living with them, 51.6% were married couples living together, 16.6% had a female householder with no husband present, and 25.5% were non-families. 21.2% of all households were made up of individuals and 6.6% had someone living alone who was 65 years of age or older. The average household size was 2.79 and the average family size was 3.25. In the town, the population was spread out with 29.8% under the age of 18, 11.6% from 18 to 24, 31.5% from 25 to 44, 19.2% from 45 to 64, and 7.9% who were 65 years of age or older. The median age was 31 years. For every 100 females, there were 94.6 males. For every 100 females age 18 and over, there were 87.1 males. The median income for a household in the town was $36,188, and the median income for a family was $39,625. Males had a median income of $34,559 versus $21,799 for females. The per capita income for the town was $14,907. About 12.6% of families and 17.5% of the population were below the poverty line, including 22.7% of those under age 18 and 9.7% of those age 65 or over. The town is home to the tower for WVLA-33 TV from Baton Rouge. The current Mayor of Addis is David H. Toups. There are five Council Members. Addis is currently represented in the Louisiana Legislature by Representative Major Thibaut (D-60th District), and Senator Ed Price (D-2nd District). In the U.S. House of Representatives, the town is represented by Rep. Cedric Richmond (D-New Orleans). West Baton Rouge Parish School Board operates public schools. Residents are zoned to Brusly High School. ^ a b c Louisiana Municipal Association (2010). "Municipality Details". Archived from the original on 2011-07-18. Retrieved 2010-07-07. ^ a b "Bank of Addis" (PDF). Louisiana Office of Cultural Development. Retrieved January 25, 2016. ^ Leeper, Clare D'Artois (19 October 2012). Louisiana Place Names: Popular, Unusual, and Forgotten Stories of Towns, Cities, Plantations, Bayous, and Even Some Cemeteries. LSU Press. p. 10. ISBN 978-0-8071-4740-5. ^ "School Profile." Brusly High School. Retrieved on December 3, 2016.